For the former Interstate 880 around Sacramento, now part of Interstate 80, see Interstate 880 (Sacramento, California). Interstate 880 (I-880) is an Interstate Highway in the San Francisco Bay Area connecting San Jose and Oakland, running parallel to the eastern shore of San Francisco Bay. For most of its route, I-880 is officially known as the Nimitz Freeway, after World War II fleet admiral Chester Nimitz, who retired to the Bay Area and lived on Yerba Buena Island. The southern terminus of I-880 is at its interchange with Interstate 280 and State Route 17 in San Jose. From there, it heads roughly northeast past the San Jose International Airport to U.S. Route 101. The Nimitz Freeway then turns northwest, running parallel to the southeastern shore of San Francisco Bay, connecting the cities of Milpitas, Fremont, Newark, Union City, Hayward, and San Leandro before reaching Oakland. In Oakland, I-880 passes by Oakland International Airport, Oakland–Alameda County Coliseum and Downtown Oakland. The northern terminus of I-880 is in Oakland at the junction with Interstate 80 and Interstate 580 (known as the MacArthur Maze), near the eastern approach of the Bay Bridge. I-880 between I-238 in San Leandro and the MacArthur Maze is used as an alternate truck route; trucks over 4.5 tons are prohibited through Oakland on I-580. I-880 is part of the California Freeway and Expressway System, and is part of the National Highway System, a network of highways that are considered essential to the country's economy, defense, and mobility by the Federal Highway Administration. Officially, the Nimitz Freeway designation is Route 880 from Route 101 to Route 80, as named by Senate Concurrent Resolution 23, Chapter 84 in 1958. Since the late 1990s, an infamous misconception for certain commuters and businesses in San Jose is that I-880 extends from I-280 to SR 85 in Los Gatos (which would extend the length to 50 miles). The Oakland Airport Connector traverses I-880 in Oakland, with Oakland–Alameda County Coliseum and Oracle Arena right of center. The state legislature added the proposed San Jose-Richmond East Shore Highway to the state highway system in 1933, and it became an extension of the previously short (San Rafael to the bay) Legislative Route 69, and part of Sign Route 13 (soon changed to 17) in 1934. From San Jose, this route temporarily followed existing Legislative Route 5 (present Oakland Road, Main Street, Milpitas Boulevard, and Warm Springs Boulevard) to SR 21 at Warm Springs, and then continued along existing county roads and city streets, now known as Fremont Boulevard, Alvarado Boulevard, Hesperian Boulevard, Lewelling Boulevard, Washington Avenue, 14th Street, 44th Avenue, 12th Street, 14th Avenue, 8th Street, and 7th Street, into downtown Oakland. It then turned north at Cypress Street (now Mandela Parkway), passing through the Bay Bridge Distribution Structure and following a newly constructed alignment (signed as US 40) to El Cerrito. The first short piece of the new Eastshore Freeway opened to traffic on July 22, 1949, connecting Oak Street downtown with 23rd Avenue. It was extended to 98th Avenue on June 1, 1950, Lewelling Boulevard on June 13, 1952, and Jackson Street (SR 92) on June 5, 1953. At the San Jose end, the overlap with Route 5 between Bayshore Highway (US 101) and Warm Springs was bypassed on July 2, 1954. Within Oakland, the double-decker Cypress Street Viaduct opened on June 11, 1957, connecting the freeway with the San Francisco–Oakland Bay Bridge. The Oakland segment was extended south to Fremont Boulevard at Beard Road on November 14, 1957, and the gap was filled on November 24, 1958, soon after the state legislature named the highway after Fleet Admiral Chester W. Nimitz. (The short spur to Route 5 at Warm Springs (now SR 262) remained in the state highway system as a branch of Route 69.) As these sections opened, Sign Route 17 (and Legislative Route 69) was moved from its old surface routing, which mostly became local streets. Other than Route 5 south of Warm Springs, the portion from San Leandro into Oakland was also kept as part of Route 105 (now SR 185). Prior to 1984, the route known as I-880 used to be part of State Route 17, which was US 48 from current I-238 to US 101 from 1926 to 1931, then US 101E from 1929 to the 1940s. SR 17 used to run from Santa Cruz all the way through San Jose, Oakland; and then continued north via the Eastshore Freeway (Interstate 80) through Richmond to the Richmond-San Rafael Bridge and San Rafael. In 1984 the segment of SR 17 from Interstate 280 in San Jose to the MacArthur Maze in Oakland was renumbered as I-880, and the portion of SR 17 from the MacArthur Maze to San Rafael was renumbered as part of I-580. In 1947, construction commenced on a freeway to replace the street routing of SR 17 through the East Bay. As noted in detail above, the new freeway was named the "Eastshore Freeway", and with the subsequent addition of a freeway to replace the Eastshore Highway north of the MacArthur Maze in the mid 1950s, it ran, appropriately, almost the entire length of the east shore of San Francisco Bay. In 1958, the portion south of the MacArthur Maze was renamed the Nimitz Freeway in honor of WWII Admiral Nimitz, while the portion to the north retained the name Eastshore Freeway. The northern portion of I-880 was designated Business U.S. Route 50 for a time between the I-80 interchange and downtown Oakland. From 1971 to 1983, Interstate 880 was the original route designation for the Beltline Freeway, the northern bypass freeway for the Sacramento area. This freeway begins in West Sacramento as a fork from the original Interstate 80, continues northeast over the Sacramento River to its interchange with Interstate 5, continues east through the communities of North Sacramento and Del Paso Heights and ends at an interchange with the Roseville Freeway (Interstate 80). The now-designated Capital City Freeway was then the original I-80 routing, continuing southwest directly into downtown Sacramento. I-80 was then re-routed along the Beltline Freeway in 1983, while the Capital City Freeway became Interstate 80 Business. A large double-decker section in Oakland, known as the Cypress Street Viaduct, collapsed during the 1989 Loma Prieta earthquake, causing 42 deaths; initial estimates were significantly higher, but because many commuters on both sides of the bay had left early or stayed late to watch Game 3 of the San Francisco-Oakland World Series, the freeway was far less crowded than normal at the time of the quake. This was the greatest loss of life caused by that earthquake. Rebuilding the affected section of the freeway took nearly a decade, due to environmental impact concerns, the feeling that the freeway divided the neighborhood, design considerations and most importantly a huge outcry from the West Oakland community demanding that the freeway find a new route - not in West Oakland. The protest was successful. The freeway reopened in July 1997 on a new route parallel to railroad tracks around the outskirts of West Oakland with the entire project being opened in 1999 and fully completed in 2001. Although only about three miles (5 km) in length, the replacement freeway cost over $1.2 billion, for several reasons: it crossed over and under the elevated BART line to San Francisco; it squeezed between a post office, the West Oakland BART station, the Port of Oakland, a rail yard, and an East Bay Municipal Utility District sewage treatment plant; it occupied an entirely new right-of-way, which required the acquisition of large amounts of valuable industrial real estate near the Port of Oakland; and of course, it had to be earthquake resistant. The former path of the structure, Cypress Street, was renamed Mandela Parkway, and the median where the freeway stood became a landscaped linear park. Several aspects of the I-880 facility have been constructed in designated floodplains such as the 1990 and 2004 interchange improvements at Dixon Landing Road. In that case the Federal Highway Administration was required to make a finding that there was no feasible alternative to the new ramp system as designed. In that same study, the FHWA produced an analysis to support the fact that adequate wetlands mitigation had been designed into the improvement project. Due to high sound levels generated from this highway and the relatively dense urban development in the highway corridor, Caltrans has conducted numerous studies to retrofit the right-of-way with noise barriers. This activity has occurred in Oakland, San Leandro, Hayward, Newark and Fremont. During the 1989 widening of I-880 in parts of Newark and Fremont, scientific studies were conducted to determine the need for sound walls and to design optimum heights to achieve Federal noise standards. Between Coleman Avenue and First Street in San Jose, State Route 87 (the Guadalupe Freeway) crosses above I-880 without an interchange, making it the only point in California where two freeways cross without a connection. Because of its proximity to the runways at San Jose International Airport, Caltrans cannot construct elevated ramps without them interfering with flight paths. Tunneling underneath to build underground ramps would also make a significant environmental impact to the nearby Guadalupe River. On April 29, 2007, a gasoline tanker overturned and caught fire on the connector between westbound I-80 and southbound I-880 on the MacArthur Maze interchange. The fire caused major damage to both this connector and one directly above (eastbound I-80 onto eastbound I-580). The overpass was replaced and re-opened 27 days later. The governor, Arnold Schwarzenegger, declared it as a State of emergency and all public transportation was free on the first commute day. Improvements to the I-280/I-880 and Stevens Creek Boulevard interchanges finished early 2015. Before construction, both interchanges shared a handful of ramps, but now, the two interchanges will be independent from one another. Construction began in late 2012 and the ramp from I-280 North to I-880 North opened in April 2015. The I-880 Corridor Improvement Project, one of the last seismic retrofit projects of a major transportation corridor in California, consists of eight separate projects located in a 15-mile segment of the freeway between Oakland and Hayward. The overall goal of the project is to improve the seismic safety of the corridor. After the 1989 Loma Prieta earthquake, the California Department of Transportation (Caltrans) initiated Phase 1 of its seismic retrofit program. After the 1994 Northridge earthquake, Caltrans initiated Phase 2 of its seismic retrofit program, which included projects along the I-880 corridor. Other goals include reducing traffic congestion and improving road quality. The individual projects included in the I-880 Corridor Improvement project are the retrofitting or replacement of the 5th Avenue, 23rd Avenue, 29th Avenue, Fruitvale Avenue, and High Street bridges in Oakland; improvements to both the I-238 and Highway 92 interchanges (the latter, a four-year project, completed in October 2011); and an overall rehabilitation/repaving project along the entire segment. Construction will take place from 2006 to 2014, although certain projects may be completed as late as 2020. The total cost of the project is $462.7 million, provided by federal, state, and regional funds. Except where prefixed with a letter, postmiles were measured on the road as it was when the route was established, based on the alignment that existed at the time, and do not necessarily reflect current mileage. R reflects a realignment in the route since then, M indicates a second realignment, L refers an overlap due to a correction or change, and T indicates postmiles classified as temporary (for a full list of prefixes, see the list of postmile definitions). Segments that remain unconstructed or have been relinquished to local control may be omitted. The numbers reset at county lines; the start and end postmiles in each county are given in the county column. 1B I-280 – San Francisco, Downtown San Jose Southern terminus; I-280 exit 5C northbound, 5B southbound; CA 17 exits 26A-B northbound; stack interchange. ^ "California Interstate Route 580 Special Restriction History". CalTrans. Retrieved 2011-07-16. ^ Federal Highway Administration (March 25, 2015). 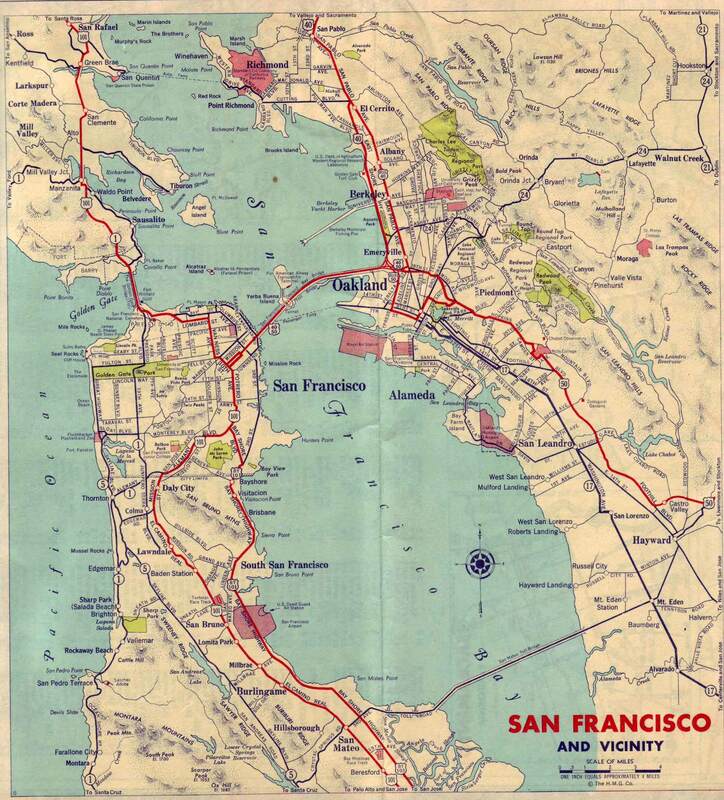 National Highway System: San Francisco, CA (PDF) (Map). Scale not given. Washington, DC: Federal Highway Administration. Retrieved July 23, 2017. ^ California Department of Transportation; California State Transportation Agency (January 2015). 2014 Named Freeways, Highways, Structures and Other Appurtenances in California. Sacramento: California Department of Transportation. p. 85. Archived from the original (PDF) on May 30, 2015. Retrieved May 30, 2015. ^ California State Assembly. "An act to amend sections 2, 3 and 5 and to add two sections to be numbered 6 and 7 to an act entitled 'An act to provide for the acquisition of rights of way for and the construction, maintenance..." Fiftieth Session of the Legislature. Statutes of California. State of California. Ch. 767 p. 2036p. 2034–2042. : "San Jose to Richmond (East Shore Highway)." ^ California State Assembly. "An act to establish a Streets and Highways Code, thereby consolidating and revising the law relating to public ways and all appurtenances thereto, and to repeal certain acts and parts of acts specified herein". Fifty-first Session of the Legislature. Statutes of California. State of California. Ch. 29 p. 280p. 287. : "Route 69 is from: (a) Route 1 near San Rafael to Point San Quentin. (b) San Jose to Richmond (East Shore Highway)." ^ Hayward Daily Review, Editorial Page, July 29, 1949: "Our main complaint with the Freeway is that it's so very short and runs you into dead ends at both 23rd avenue and at Sixth street so that the turn-off is hardly worth the bother." ^ California State Assembly. "Senate Concurrent Resolution No. 23—Relative to the designation of State Highway 17 as the 'Nimitz Freeway'". 1958 Session of the Legislature. Statutes of California (Resolution). State of California. Ch. 84 p. 154. ^ California State Assembly. "An act to amend Sections 306, 320, 332, 351, 362, 365, 369, 374, 382, 388, 397, 407, 408, 409, 410, 415, 422, 435, 440, 446, 453, 456, 460, 467, 470, 476, 487, 492, 493, 494, 506, 521, 528, and 529..." 1959 Session of the Legislature. Statutes of California. State of California. Ch. 1062 p. 3116p. 3121. : "Route 69 is from: (a) San Jose to the Richmond-San Rafael Bridge Toll Plaza including a connection to Route 5 near Warm Springs." ^ California State Assembly. "An act to establish a Streets and Highways Code, thereby consolidating and revising the law relating to public ways and all appurtenances thereto, and to repeal certain acts and parts of acts specified herein". Fifty-first Session of the Legislature. Statutes of California. State of California. Ch. 29 p. 282-283p. 287. : "Route 105 is from:...(c) Hayward, via Fourteenth Street in San Leandro, to Seventh and Cypress Streets in Oakland." ^ a b "End of US highway 48". ^ Carter, E.J. (May–June 1949). "Rapid Progress: East Shore Freeway Project in Oakland Nearing Completion". California Highways and Public Works. 28 (5–6): 6–10. ISSN 0008-1159 – via Archive.org. ^ Haberman, Clyde (13 April 2014). "Promises of Preparedness Followed Devastating Earthquakes. And Yet". Retrieved 10 April 2018 – via NYTimes.com. ^ Jackson, Brett. "Replacing Oakland's Cypress Freeway". Public Roads. Retrieved 29 May 2015. ^ Google (June 8, 2009). "Interstate 880" (Map). Google Maps. Google. Retrieved June 8, 2009. ^ a b Richards, Gary (July 23, 2007). "Missed connection: Why there is no interchange at Hwy. 87 and I-880". San Jose Mercury News. Retrieved August 2, 2015. ^ Vink, John A. (July 25, 2009). "Community Meeting reveals I-880/I-280/Stevens Creek/Winchester plans". South Winchester News. ^ ""Construction along 880 corridor will mean better roads" Heather Ishimaru, KGO-TV(ABC 7), July 14, 2010". Abclocal.go.com. 2010-07-14. Retrieved 2013-01-26. ^ ""$227 million freeway project will protect Nimitz commuters in Oakland" Cecily Burt, Oakland Tribune, May 12, 2010" (PDF). Retrieved 2013-01-26. ^ "Caltrans Seismic Retrofit Program". Dot.ca.gov. Retrieved 2013-01-26. ^ "I-880 Corridor Improvement Project Website". I880corridor.com. 2011-10-07. Retrieved 2013-01-26. ^ Eric KurhiOakland Tribune (2011-10-08). "At long last, improved connectors open at Hayward traffic trouble spot - San Jose Mercury News". Mercurynews.com. Retrieved 2013-01-26. Wikimedia Commons has media related to Interstate 880.